We build products at Google Cloud to make life easier for our customers—to enable them to organize, access, and understand their world of information. Although different businesses have different needs, virtually all of them want a comprehensive view of their data. But that can mean managing purpose-built IT infrastructure, or spending large amounts of time cleaning up messy data before it can ever be put to use. 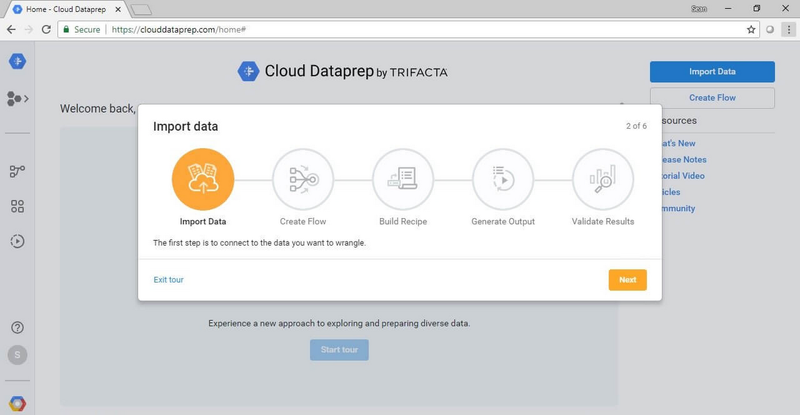 Today, we’re excited to announce the general availability of both Google Data Studio, our free modern business intelligence product, and Cloud Dataprep, our fully-managed data preparation product, powered by Trifacta. When we launched Data Studio in 2016, we set out to build a simple-to-use but powerful business intelligence (BI) platform to make visual analytics more accessible. With Data Studio, you can easily access and analyze data from Google Cloud and Google Marketing Platform sources alongside more than 500 other data sources via more than 100 partner-built connectors. This means you can visualize and interactively explore data in compelling dashboards or reports, easily share insights with others or collaborate in real-time with colleagues, whether you’re sitting across the room or across continents. As a result, it’s now being used by over a million people around the world, every single month. During our two years in which we’ve run a fruitful public beta, we’ve carefully listened to our customers and expanded critical capabilities of Data Studio. Users in retail, financial services and insurance, marketing, technology, hospitality, media, and other verticals inspire us with their questions and examples around supply-chain, marketing, sales analytics, and data storytelling use cases. We’re also especially inspired by the data stories being generated though our Visualize 2030 contest, grounded in the United Nations’ 2030 Agenda for Sustainable Development. AirAsia Group (AirAsia) operates flights across Asia and beyond. Founded in 2001 as a pioneer of low cost air travel in southeast asia, AirAsia has grown to serve more than 222 routes and 110 destinations from hubs in Malaysia, Thailand, Indonesia, the Philippines, and India. "Data Studio helps to keep AirAsia data flowing through the organization,” says Nikunj Shanti, Chief Data Officer, AirAsia. “Data democratization is the key for future efficiencies within the airline and the integration between Data Studio and BigQuery data sources help ensure that everyone has a single view. The platform has rapidly evolved in the last 12 months, and we’re able to sunset existing production and ensure we have a single platform for data dashboard and ad-hoc visualization." Based in the UK, Ocado is the world’s largest online-only grocery retailer, and it offers the Ocado Smart Platform sales and logistics system to third-party retailers. On any given day, Cloud Dataprep has organizations scheduling thousands of predefined jobs or performing ad-hoc data preparation. Customers like Foundation for Precision Medicine, Alpha Vertex, Unacast, Craveable Brands, and Farmlogix are taking advantage of Cloud Dataprep to make it easier and faster to work with their data.